Benefit from the Midas touch in this five-reel slot from NextGen Gaming featuring a free spins round and Superbet function. Just like King Midas in Greek mythology, Miss Midas can turn things into gold, and in this case she can help you to scoop some big prizes. Learn all about the Miss Midas slot machine in our gilded game review as we guide you through how to play and its bonus features. 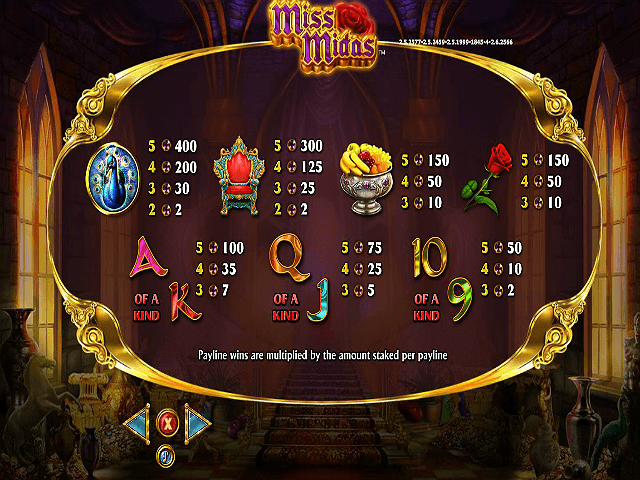 Play Miss Midas Slot Demo for Free! Play Miss Midas for Real Money! This online video slot takes the legend of King Midas and gives it a female twist. Midas was famous for his ability to turn everything he touched into gold, which is where we get the expression ‘Midas touch’ from to describe someone who’s financially successful in everything they do. The design of the screen is neat and easy on the eye, and of course gold is the prominent colour. 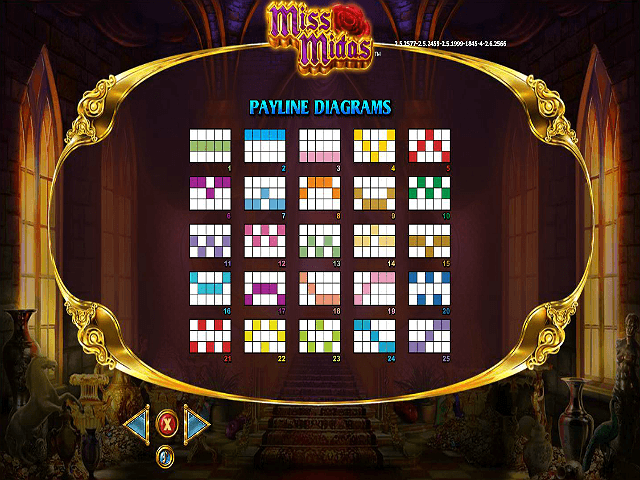 The Miss Midas slot game features the standard layout of five reels and 25 paylines, with all 25 permanently enabled. It's playable from 25p to £500 per spin so caters to all types of players. The top-paying symbols on the reels are the wild and scatter, but more on them later… There’s also a peacock, a throne, a bowl of fruit and a rose, all representing the theme of opulence. The peacock is the highest-paying of these, with 400 coins for landing five. The other six icons are made up from the card ranks from nine to ace. Miss Midas is, as you’d expect, the most lucrative character in the game, awarding you 500 coins for landing five on a payline or 250 for getting four. She acts as a wild, substituting for all others except the scatter. But that’s not all. She can also turn adjacent symbols gold and they become wild for all others except the scatter. Which icons the marvellous Miss Midas can turn to gold depends on the Superbet level. To the side of the reels you’ll see a meter with four characters in it. The first two – throne and peacock – can always be turned into gold, but for an extra ten coins you can also enable Miss Midas to turn the fruit into gold. If you pick the top Superbet level of 25 coins, all four of the main base game symbols can be turned to that precious metal. 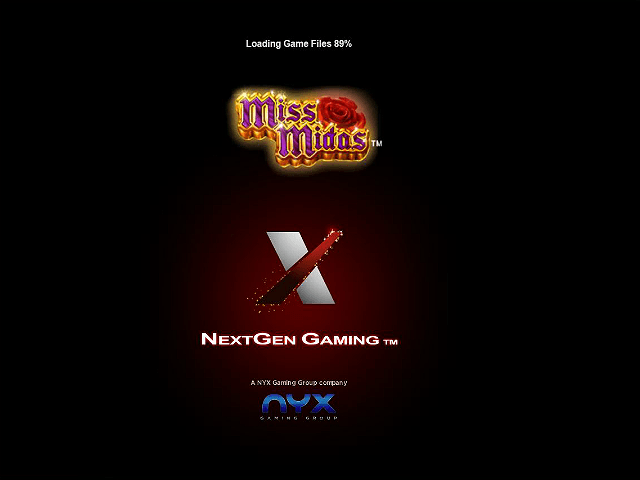 Miss Midas also offers a Free Game feature. Landing three, four or five scatter icons (the castle) will grant you 15, 20 or 25 free spins respectively. During this play, any character that’s turned to gold will turn adjacent Superbet-enabled symbols into gold – there’ll be carats of the gorgeous glittering stuff everywhere! This feature can also be retriggered for even more free spins. The scatter itself is the top-paying symbol on the board, delivering 2,500 coins when you land five of them on a payline. 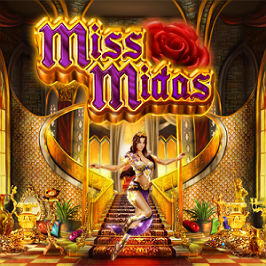 The final feature in the Miss Midas slot is a Gamble, allowing you to multiply your winnings. After any win, you can press the Gamble icon to guess either the colour or suit of a card. If you get the colour right your win’s doubled and if you get the suit right it’s quadrupled. Wins can be gambled up to five times. Think you’ve got the Midas touch? Start spinning with Miss Midas today to find out! Share this Miss Midas Review today! 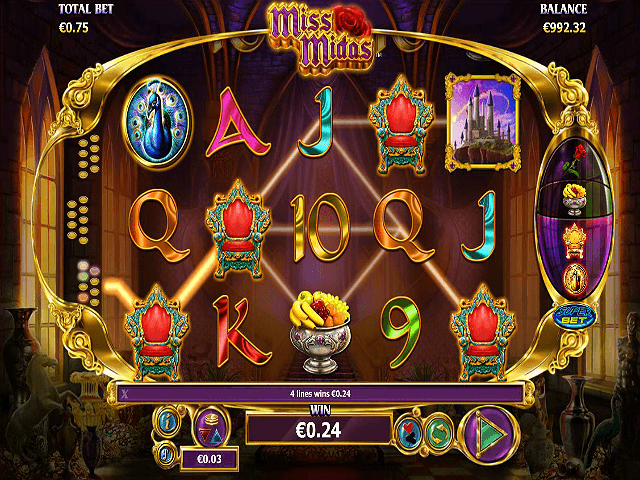 If you like Miss Midas, you'll love these slot titles too!